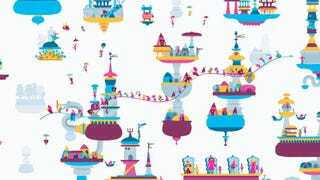 Hohokum came out for the various PlayStation platforms yesterday. The beautiful, weird exploration game isn't quite like anything else on the video game landscape lately. So it's really messed up that some folks who bought the game for the PS4 are saying that they can't play it. Over on Sony's message boards and Twitter, many users are complaining that they're getting on-screen messages with the CE-34632-8 error codes, meaning that the console can't start the game. Fixes like rebuilding the PS4's database and deleting and re-downloading the game are reportedly not working, either. It's true that video game roll-outs large and small can be plagued with problems. But it's especially sad to see an oddball labor of love like Hohokum—which gets a fraction of the promotion and buzz that other titles do—wind up unplayable for the people who took a leap of faith and bought the game. We've reached out to Sony for comment and will update this story if they respond.